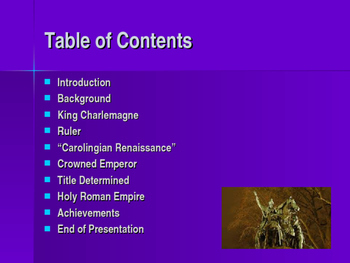 This is a 12 slide, highly animated, power point presentation on The Key Figures of the Middle Ages: Charlemagne. All the slides are editable so you can modify the slides if you need to. 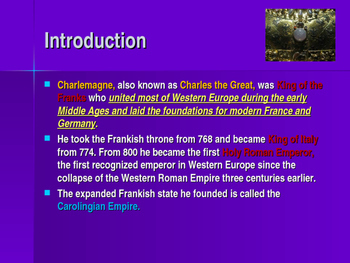 Charlemagne, also known as Charles the Great, was King of the Franks who united most of Western Europe during the early Middle Ages and laid the foundations for modern France and Germany. From 800 he became the first Holy Roman Emperor, the first recognized emperor in Western Europe since the collapse of the Western Roman Empire three centuries earlier. 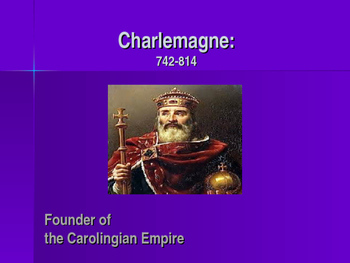 To ensure justice, Charlemagne had these laws set down in writing and strictly enforced. He also issued capitularies that applied to all citizens. 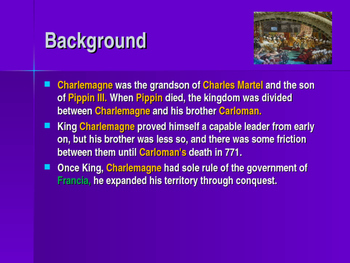 Charlemagne kept an eye on events in his empire through the use of representatives who acted with his authority.